You can learn about Patient and Family Centred Care activities at Alberta Children's Hospital by reading our monthly e-newsletter - Together We're Better. This newsletter will give you insight into Family Centred Care Initiatives, profile our Family Centred Care champions, and keep you up to date on upcoming education opportunities. Archived copies are available on the FCRC website. To receive the newsletter via email, please send your email address to achfcc@albertahealthservices.ca. Welcome to the June edition of Together We're Better. Most people have never heard of Neurofibromatosis (NF). And, it's not surprising considering only one in 10,000 people are diagnosed with this rare disease in the world. For the Jones family, NF became a way of life since their son, Michael, lived with this diagnosis until he passed away in 2015 at the age of 21. The Neurofibromatosis (NF) Education & Information Sharing Event, spearheaded by the Jones family, in collaboration with the R.B. Lowry Genetics Clinic, was held on May 12, 2017 at ACH. Over 100 people attended this event, including approximately 42 family members. "I've never met someone with NF," was the common theme throughout the day. 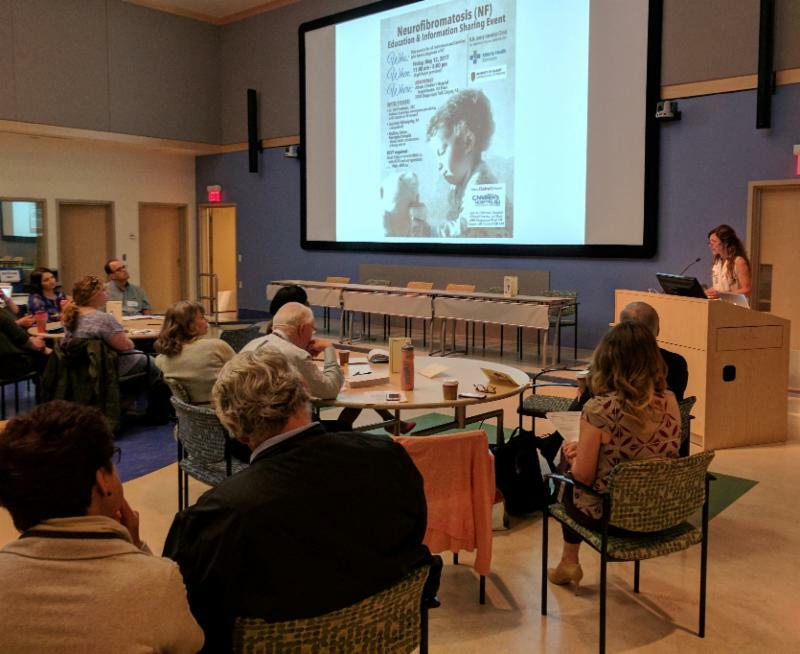 What makes this event unique is that it was family-driven and brought together families with NF and healthcare practitioners who work with these families. One of the guest speakers was Courtney Willoughby, a Registered Nurse whose story gave a courageous look as a person living with Neurofibromatosis. 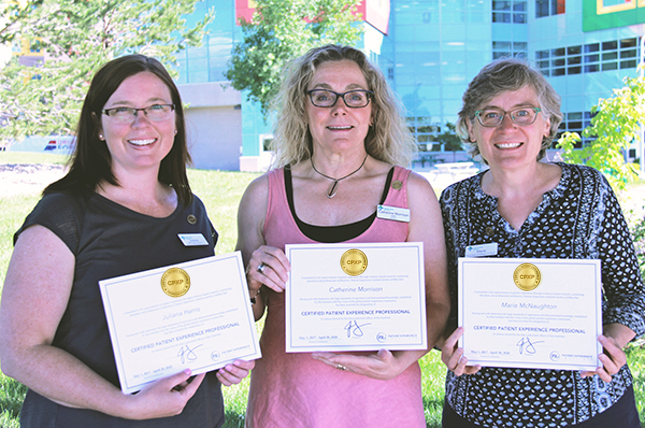 This May, three of our Patient and Family Centred Care staff became Certified Patient Experience Professionals, a designation earned from the Patient Experience Institute. Congratulations Catherine Morrison, Patient Care Manager and Site Manager for PFCC; Marie McNaughton, Family and Youth Engagement Coordinator; and Juliana Harris, Patient and Family Centred Care Liaison! Juliana Harris, Catherine Morrison, and Marie McNaughton proudly holding their award certificates. Requests have been coming in for Patient and Family Advisors to take part in different Quality Improvement (QI) projects and committees around the Hospital. In May, 14 of our Advisors participated in a four-hour workshop to learn about AHS Improvement Way (AIW) processes to support their participation in QI work. This was the first time AHS has offered this workshop exclusively for Advisors. "Patient Advisors are in a wonderful position to recognize areas for improvement and work towards change. The AIW course provides Advisors with the tools to identify these areas, plan an intervention, trial the solution and evaluate any progress made," stated one participant. The course is a high-level overview of AIW tools and processes that lay the foundation for work by applying them in a tabletop simulation based on a clinical scenario. Participants saw dramatic improvement in outcomes by focusing on value-added activities and actions without having to add resources. "The simulation was eye-opening. It was more fun than I thought it would be and I really learned a lot by doing that exercise," said another Family Advisor. Plans are underway to offer another course in the fall for additional Advisors. Our PFCC team was honoured to be selected in the top five nominated for the President's Excellence Award in Patient and Family Centred Care for our work on the Patient and Family Engagement Framework. Congratulations to the other finalists and the award winner, CoAct. Go to the AHS website to learn more about the great work that is happening in PFCC. Our Child and Youth Advisory Council is looking for new members for the fall of 2017. We are recruiting youth ages 12-16 with patient or sibling experience from around Southern Alberta. Please tell youth you know about this opportunity! Using psychoeducational, cognitive, and behavioral strategies delivered to personality-specific groups of youth in the schools, the Preventure program has been shown in a set of randomized controlled trials (RCTs) to have lasting effects on adolescents' mental health and addictive behaviors.